It may sound like an unusual combination but a hint of fiery chilli complements a rich chocolate dessert perfectly. Serve with a spoonful of thick cream or Greek yogurt for a really indulgent dessert. 1 Lightly dust a work surface with flour and roll out the pastry to about 3mm thickness. Use to line six 10cm tartlet tins. Prick the bases with a fork and chill in the fridge for 30 minutes. Preheat the oven to 200°C/fan 180°C/gas mark 6. 2 Line each tartlet tin with a circle of baking paper and fill with baking beans. Bake blind in the preheated oven for 7-8 minutes. 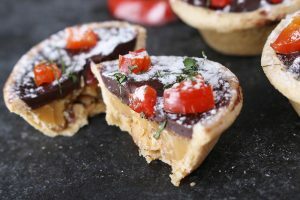 Remove the beans and paper and bake the tarts for a further 4-5 minutes until the pastry is crisp and pale golden. Leave to cool completely, then remove the pastry cases from the tins and place on a board. 3 Divide the salted caramel sauce between the cold tartlet pastry cases, smoothing the surfaces level with the back of a teaspoon. Chill in the fridge for 30 minutes. 4 Place the butter and chocolate in a heatproof bowl set over a pan of simmering water and leave until melted. Remove the bowl from the heat and stir the mixture until smooth. Cool for 20 minutes then spread over the salted caramel filling. Chill for 1 hour or until set. 5 To serve, sprinkle the chopped chilli pepper over the set chocolate topping and scatter over the shredded basil (if using). Dust with icing sugar. Blanch the chopped chilli pepper in boiling water for 1 minute, then refresh under cold water and pat dry with kitchen paper. This will remove a little of the fiery heat from the chilli. If you prefer, replace the fresh chopped chilli with a sprinkle of dried chilli flakes.